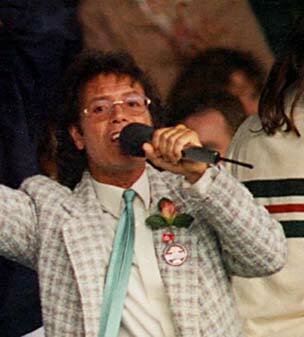 London, June 20: British pop singer Sir Cliff Richard is annoyed with the claims that his impromptu singalong at Wimbledon in 1996 was a publicity stunt. The 70-year-old had led the singalong on the Centre Court when the rain stopped the play. However, he is pissed off with the claims that it was a publicity stunt. A spokesperson for the singer has clarified that the star sang after Wimbledon officials, who had asked him for an interview, suggested that he should sing. "There is a story afoot that Cliff's impromptu singalong at Wimbledon was engineered by his then PR Company. This was not the case," the Daily Express quoted his spokesman as saying on his website. "Cliff was approached by Wimbledon officials initially for a straightforward interview and they subsequently suggested that he sing a song or two," the spokesman added.